The Banana Splits are a half remembered element from my childhood, something I associate with the other quasi-hippie cartoons and live action shows from the late 60s and early 70s. Not as counter culture as the drug influenced Sid and Marty Kroft shows, but still with a touch of flower children to them. I know the show has been revived in recent years, but the Fleegle, Bingo, Drooper and Snork are still much as I kind of remember them in this tale. At least, at the beginning of it. Of the DC/Hanna Barbera crossover books this week, this one was definitely my favourite. 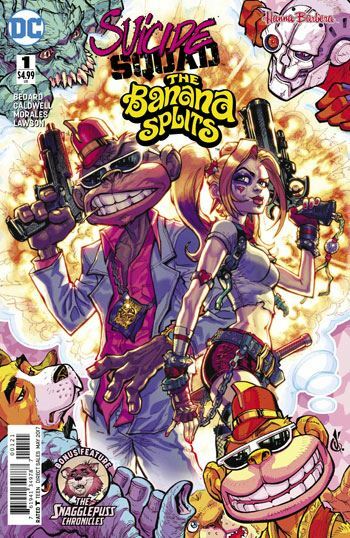 The Banana Splits get arrested, and just before prison life threatens to remove their innocence, Amanda Waller recruits them for a special mission to save the Suicide Squad. The two teams would seem to be about as far apart as possible, and Bedard takes full advantage of this. 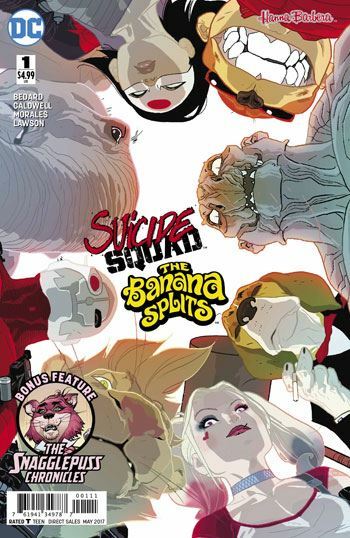 The story is far more playful than a typical Suicide Squad story, but still pushes the Banana Splits into becoming darker versions of themselves. By the end, the band has found a way to express their new darkness, and it’s just as silly as before. I am not overwhelmed by the art on this lead story, though. Deadshot in particular does not look right at all. Ultimately, though, none of that really matters. It isn’t the lead story that makes me recommend this issue so strongly. It’s the Snagglepuss back-up story that impressed me hugely. The media has already given some play to the fact that Snagglepuss has been re-thought as a gay character. This story, set in 1954, essentially makes the mountain lion into Tennessee Williams, a gay playwright from the southern US, who has to deal with an investigation and insulting questions by the House Un-American Activities Committee. The tale has moments of humour, but also a deeply serious side, and the politics are all too similar to the recent surge to the extreme right wing that the US has taken. Snagglepuss becomes a defender of free speech and minority rights, at a time when anything other than conformity was considered a threat to their nation. One line in the tale really stood out for me.